The gentle ebb and flow of the northern Pacific Ocean whispered in our ears as we spent the night on the sands anticipating the morning's fishing foray. Checking the tide tables the day before, I knew a minus-1.58 low tide was predicted for the following day at 7 a.m.
Now, I love to fish, but getting up early has never been my strong suit. However, I had a spot in mind, a rocky reef loaded with cracks, crevices and undercuts that I knew would be teaming with fish and our intended quarry for the weekend, eels. As the sun rose and we made our way along the boulders and hopped over crags, my girlfriend Diane and I felt very much awake and ready to try our luck. Of course, even though I was showing her the ropes when it came to poke pole fishing, she showed me up by the end of the day. What made me laugh even harder was the simple fact that the crudest poke pole ever constructed out-fished our commercial rod and reel setup, so much so that I am tempted to leave the fishing rod at home next time. Poke pole fishing, aka poke poling, is a method of procuring rockfish and eels from the intertidal zone that is as effective as it is peculiar. Despite the vast array of dirty jokes that accompany a method of fishing that sees a tool, referred to as a poke pole, continually thrust into cracks and crevices, this fishing style is actually one of great antiquity. Instead of approaching the sea with a rod and reel, casting out from the rocks as far as the line will sail in hopes of securing fish, poke poling targets the sea life right beneath one's feet. The gear is comprised of five components and a setup that can be constructed in 10 minutes in the parking lot of your favorite rocky seashore. The poke pole itself is an 8- to 12-foot-long tapered limb or stalk of bamboo, with a straight piece of coat hanger extending from the tip. 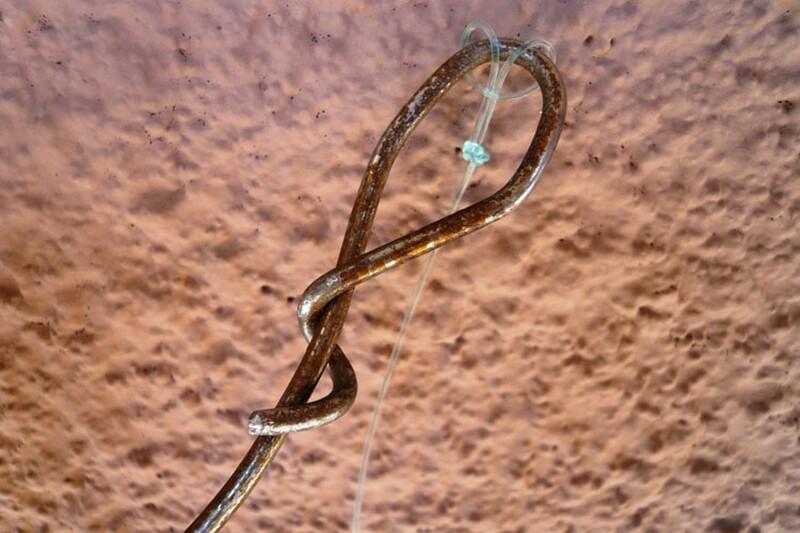 The coat hanger is securely wrapped around the "rod tip" using pliers, and a loop is bent in the end and wrapped several times around the straight coat hanger wire stock to prevent even the strongest fish from bending the loop straight and therefore keep the fish from escaping. "You need a wire hanger. There are people who will debate this, but the wire hanger is a must," explains Kirk Lumbard, the world record holder for monkeyface eels. 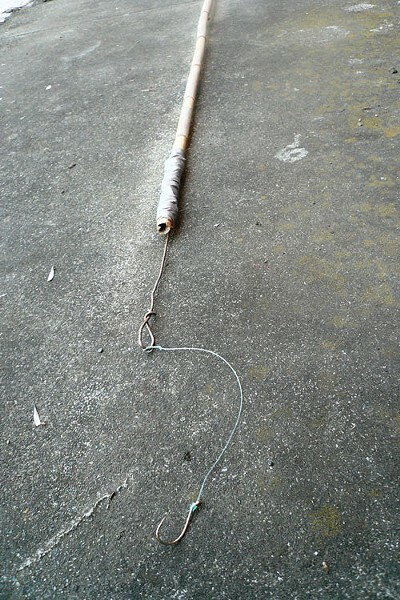 Over the portion where the wire hanger is wrapped around the wood or bamboo, a second layer of tightly wrapped string and a third layer of duct tape is added to reinforce the "haft." Next, a cheap, large octopus hook (size 4) is attached to the loop with a 6-inch leader (precisely the length that is usually standard on hooks bought for $1.50 for a five pack at most sporting goods shops). You want a leader that is at least 25-pounds strength tested, but 50-pound test is preferred. 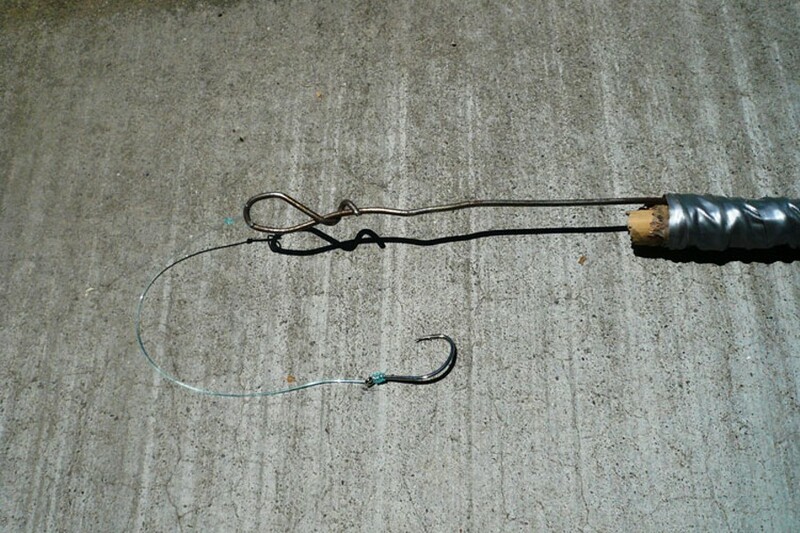 The hook is baited with a one-inch piece of squid (the fresher the better) and this odd fishing setup is ready to rock! The idea is simple: Carefully move along the water's edge and locate holes between rocks at least a foot deep. Work the poke pole tip back into these holes and deep under rocky ledges where an eel might be sitting. Wait about 30 seconds to a minute before moving your bait to another area within the hole. Once you feel that you have thoroughly presented your bait in that particular spot, move a few feet down the reef to locate a new hole. If a fish or eel bites your bait, simply pull back to set the hook and transfer the quarry to a net (most eels will throw the hook in a few seconds if not netted immediately). Jetties and natural boulder piles are the most likely place to locate fish and eels. 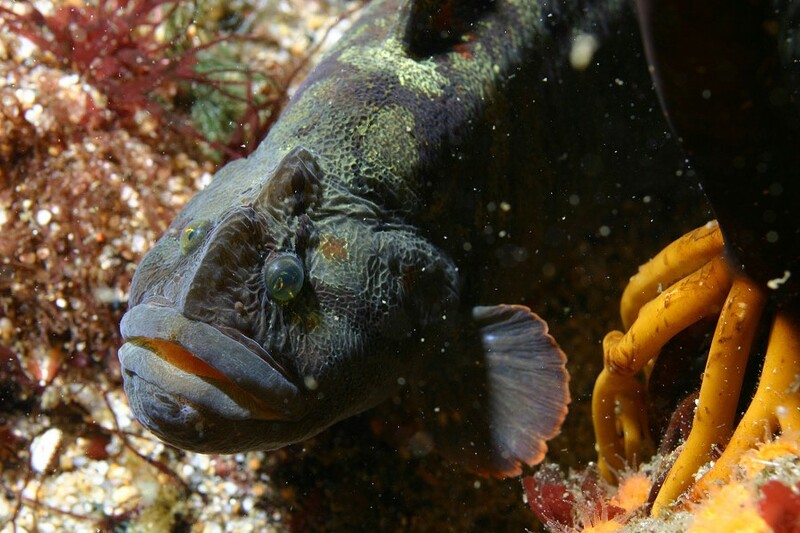 There is currently no size limit for monkeyface eels or intertidal rockfish, but there is little meat on eels less than a foot in length or on rockfish shorter than eight inches. 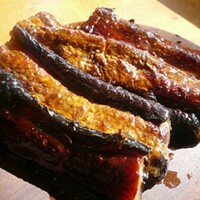 On a good day, an angler can easily land five or more of these unique and tasty sea creatures (though see special regulations for daily bag limits of rockfish). While most anglers use a tackle box to keep extra hooks and bait while fishing freshwater lakes and streams, a backpack is definitely the way to go when working an intertidal rocky reef. A pack allows anglers to keep all necessary gear on their back, enabling them to use their hands to maneuver across slick, algae-covered, rocky terrain. It's like I always tell rookies when they first go into the intertidal zone, "Be like a crab, stay low to the ground and always have multiple points of contact with the rocks as you move." There is no shame in being only semi-bipedal and using your hands to navigate. In fact, this is the strategy employed by all experienced shore anglers for good reason; it will prevent you from falling. In addition to the backpack, a few garbage bags, pliers, extra hooks and leaders, a net, a stringer, bait, a hat, sunscreen, water, lunch and an extra jacket are also all essentials. Just be sure to pack out whatever you pack in. A few additional tips: Remember, if you leave your fish in the water to keep them fresh, tie them to a rock way higher than you might think necessary so a rising tide doesn't come between you and your catch while you fish a different hole. Always watch rising tides to be sure you can get back safely to shore. Do not venture into the intertidal zone unless you know how to swim and, if you don't, please take lessons, your life may depend on it. Finally, always be sure to follow all California Department of Fish and Wildlife regulations, which can be found online or in a printed booklet free of charge at any sporting goods store. For gear recommendations, check out Bucksport Sporting Goods in Eureka and ask for Todd (an old friend of mine). For more information, see Kirk Lumbard's poke poling tutorial on YouTube at www.youtube.com/watch?v=70mtYr1V46g.